Brian Lopes is twenty eight years old, he was born in California. He has been racing professionally now for six years. 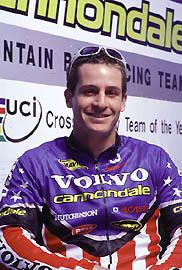 His competitive background includes BMX racing, where those skills come into play when racing mountain bikes downhill. His favoutite race of the season takes place in Squaw Valley, Utah where he finished 32nd out of a tough 105 competitors. When he's not riding, he can be found working out, fooling around with his Harley's, and or taking a few runs on the local motocross track.